Grounds for Change, a specialty coffee roaster based in the Seattle area, has released another coffee in its disaster relief/NGO support series. 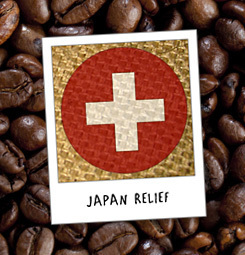 The Japan Relief Blend released today is aimed at providing coffee drinkers with a simple way to donate to relief efforts in Japan. The Japan Relief Blend is Fair Trade, Organic and CarbonFree® Certified, and for each regularly priced 12 ounce bag purchased, Grounds for Change will donate $2.00 to the Japan Earthquake fund at Mercy Corps, a relief and community support organization based in Portland, Oregon. Japan Relief Blend: http://www.groundsforchange.com/shop/product.php?pid=152 “Grounds for Change is an engaged member of our global community and as such, we feel compelled to reach out to those in the Miyagi, Fukushima and Iwate Prefectures, as well as other communities affected by the March 11th earthquake, to provide much-needed assistance,” said Kelsey Marshall, Co-Founder of Grounds for Change. “The need for relief is massive and the urgency is acute. Many people want to help but don’t know where to start. We’re making it easy for those who drink coffee to make a contribution.” Grounds for Change roasts exclusively Fair Trade Certified, Organic, CarbonFree® Certified coffee which is grown in shaded conditions. In 2008, Grounds for Change partnered with CarbonFund.org to offset 100% of the global warming emissions associated with the full lifecycle of their coffee. Grounds for Change is the first coffee roaster in the country to complete the rigorous third-party certification process necessary to obtain the CarbonFree® Certified Product label. Grounds for Change is also a member of 1% for the Planet and donates at least 1% of its revenues to environmental organizations each year. In addition to donating to numerous disaster relief efforts throughout its eight years, Grounds for Change has developed partnerships with a number of non-profit organizations such as The Humane Society of the United States, Wildlife Land Trust, Seattle Audubon Society and others. Grounds for Change donates a portion of sales from each of these partnership coffees to support the on-going efforts of these valuable organizations. Grounds for Change coffee is served at independent cafï¿½ locations around the country and is available online exclusively at www.GroundsforChange.com. Press release reprinted from CSRwire.com.